In earlier articles on the subject of pre-sidedress nitrate testing (PSNT), we discussed how this testing process can help farmers make informed decisions about whether particular corn fields need more nitrogen fertilizer to optimize their yield, rather than guessing (see past articles below). As the corn starts to grow and the flurry of spring farming activities subsides, it is not uncommon for farmers to start wondering exactly how much nitrogen they lost from their fields due to leaching, volatilization, or denitrification. It is reasonable to suspect that some was lost, but you cannot tell just by looking. It is not uncommon for farmers to have the local fertilizer dealer dribble on a fixed number of pounds of 32% UAN per acre between the rows. At about $1/pound of actual N, this can be very expensive. If all of those pounds are needed on every acre, it is worth it; if not, the money is wasted. Just yesterday we received the PSNT results for one local farmer who decided to test 13 fields before ordering fertilizer. The results are below. To interpret the results, understand that the yield goal, in this case, is about 20 tons of silage per acre. If soil nitrate levels are 25 ppm or more, no additional fertilizer is necessary, even for 25+ ton yields per acre. 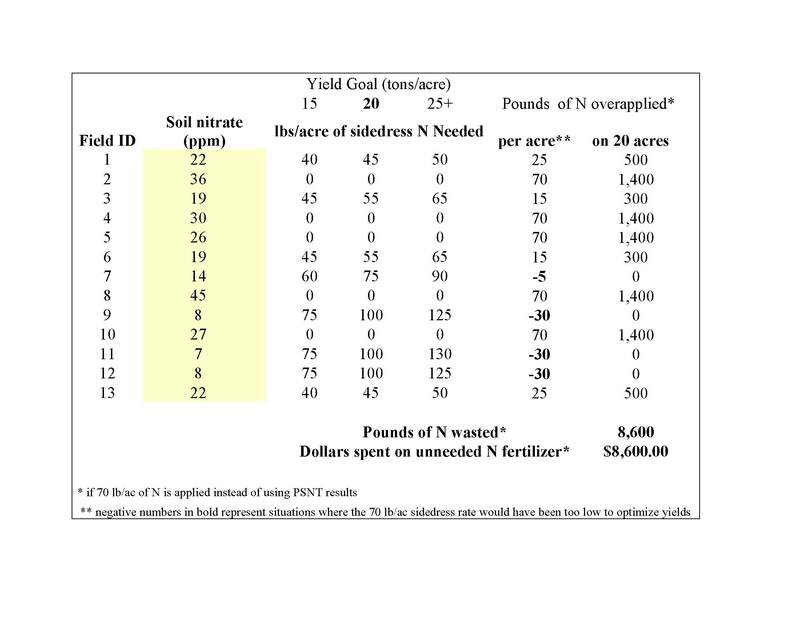 Notice that the results describe the level of nitrate in the soils of each field tested and give a sidedress nitrogen recommendation specific to each field. What would have happened if this farmer did not take the PSNT and act accordingly? If they decided not to sidedress anything, they would probably see significantly reduced yields in 8 of the 13 fields. If they used an alternative strategy and applied 70 pounds of nitrogen on everything, how close would they have been to the optimal rate? If we make the conservative assumption that each of these fields is 20 acres in size, they would have wasted a total 8,600 pounds of nitrogen fertilizer on 180 acres by putting it on at rates greater than the crop needs! Further, they would have still been short on nitrogen in four of their fields (80 acres), likely with a significant yield penalty. In this case, and in many others, pre-sidedress nitrate testing is a very profitable activity. If it is too late to take PSNT samples on your farm this year, keep the practice in mind for next season. Over time this type of testing will help you understand nitrogen dynamics on your farm and probably save you a bundle of money. If you are not sure if it is too late to use the pre-sidedress nitrate test on your farm or have other agronomic questions, do not hesitate to call me or your local Extension office.